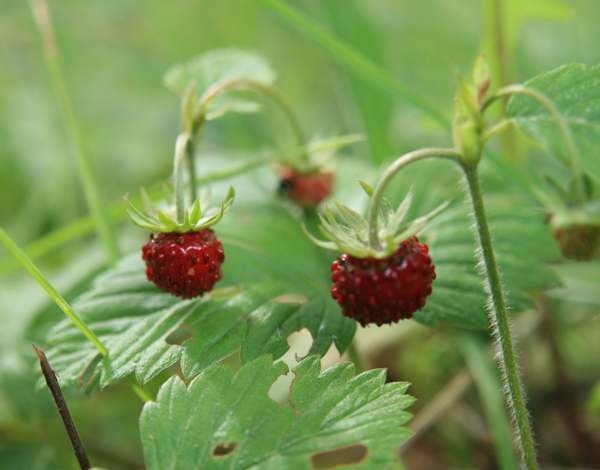 Because of their habit of nestling among taller plants and grasses, it is not always easy to spot Wild Strawberries, whether they are in flower or bearing bright red fruits. European (Wild) Strawberry is sometimes referred to as Alpine Strawberry, despite the fact that this low-growing wildflower with a head for heights has its feet firmly on the ground - Fragaria vesca an be found right down to sea level, where it grows on some coastal cliffs. The lovely five-petalled flowers produce bright red fruits each with some 150 or more seeds on their outer surfaces. Slugs, mice and many other creatures enjoy the fruits and spread the seeds (strictly called achenes). Clones of a plant are produced from rooting nodes on runners, so that Wild Strawberries often create impressive patches - great for those with the patience to collect these tiny tasty treats. 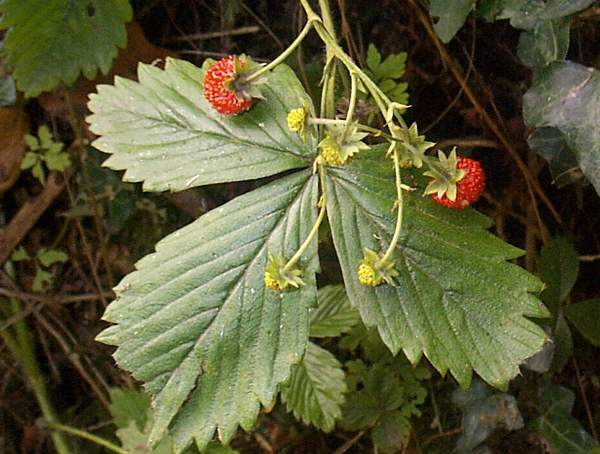 Wild Strawberries are very common throughout Britain and Ireland, and Fragaria vesca is sometimes referred to as the European Strawberry because its range also includes most parts of mainland Europe. This perennial is native to many other regions of the northern hemisphere including much of Asia, North America and South America. Hedgerows and dry grassy banks are good places to look for Wild Strawberries; they also grow in shady woodlands, where the fruits rarely ripen. 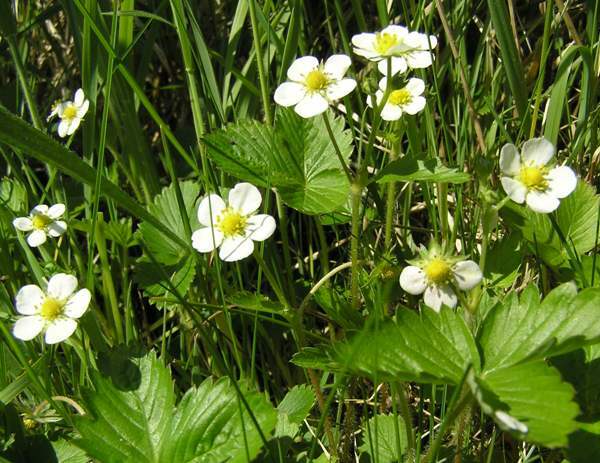 The flowers of Wild Strawberry appear inspring and early summer, with the fruits ripening from July onwards. It will come as no surprise to hear that Wild Strawberry has been sought as a source of food down the ages. The flavour of these tiny strawberries is very sweet and intense when they are ripe - we consider them to be even better than the cultivated ones. Alpine Strawberries are much prized in northern and central Europe, including Slovenia and Bulgaria, where they are used to make preserves and fruit sauces which are particularly good with ice cream. Fragaria, the genus name, is the Latin word for strawberry (and Fragum is the Latin word for fruit). The specific epithet vesca is also Latin and means small or thin. Barren Strawberry Potentilla sterilis produces strawberry-like flowers but no edible fruits. The pictures of Wild Strawberries shown on this page were taken in West Wales in April (the flowers) and in June in Slovenia (the ripe fruit).